Is Shrimp Healthy for a Diet? With hundreds of options for protein in your diet, shrimp provides a meaty-textured choice with a delicate flavor. Served both hot and cold, you can use shrimp in sushi, casseroles, sandwiches and soups, and you can even eat them plain with butter or cocktail sauce. For most people, shrimp can be part of a healthy diet, and its low-mercury content makes it an attractive choice. If you must watch your cholesterol, however, you might consider lower-cholesterol seafood selections. Shrimp is a wonderful source of omega-3 fatty acids, protein, B-12 and selenium. And as long as it's not fried or prepared with unhealthy sauces, it can be a healthy part of any carnivorous diet. Most of the calories in this seafood derive from protein, with a small portion coming from fat. A serving of shrimp contains almost no fat, with a tiny portion coming from saturated fat. Limit the saturated fat in your meal plan to 22 grams per day or less. Shrimp also contains 165.8 milligrams of cholesterol per serving, over half the recommended limit of 300 milligrams per day. While saturated fat and cholesterol often gets the blame for increasing your risk of clogged arteries, other issues factor in, including your lifestyle and genetic propensity to heart disease. 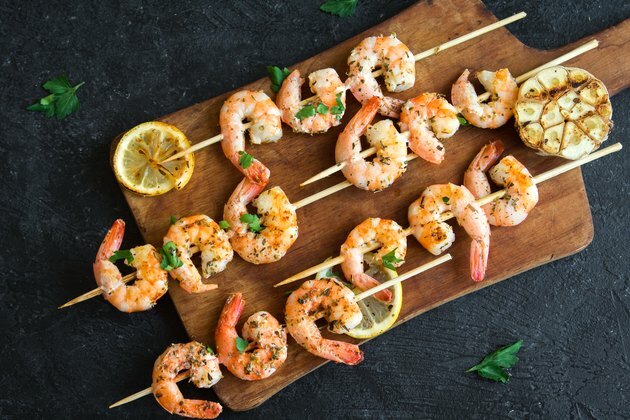 However, shrimp also contains omega-3, a fatty acid that could help prevent or reduce your risks for heart disease and other health conditions, such as diabetes. The United States Department of Agriculture recommends two servings of fish or seafood each week. A serving of shrimp provides 20 grams of protein. This amount makes up a considerable portion of the 46 to 56 grams of protein you should consume each day to bolster your immune system, build lean muscle fiber and produce energy. Include shrimp in your diet if you're a woman to cut down your risk of coronary heart disease. A study in the August 2010 issue of the journal Circulation correlates a higher protein intake from seafood, including shrimp, with a lower chance of developing cardiovascular issues in women between the ages of 30 and 55 years of age. Shrimp serves as a good source of vitamin B-12, with 21.1 percent of the daily recommended intake. The vitamin B-12 in shrimp contributes toward the function of your nerves. A serving of shrimp provides under 10 percent of the vitamin B-6, vitamin E and vitamin A you need each day as well, which makes shrimp a good pick to improve your eyesight and skin. Eat a serving of shrimp, and you consume nearly half the selenium you should consume daily. Selenium plays a critical role in the proper function of your thyroid and provides antioxidant protection. One serving of shrimp also contains 14.6 percent of the iron and 11.6 percent of the phosphorus your diet requires every day. Additionally, you take in approximately 8 percent of the daily recommended intake of zinc and copper. While shrimp contain low levels of mercury, this seafood still contains a small amount of the potentially dangerous contaminant. Limit your consumption to 12 ounces of shrimp in a seven-day period to avoid health problems. Make sure that you do not consume raw or undercooked shrimp since this could lead to foodborne illness. How Bad Is the Cholesterol in Shrimp? Can I Lose Weight If I Eat Shrimp?